A saloon in the UK and saloon across the globe is a body style of a car and it is one of the most popular car styles across the globe. It is still very popular but there are several other body types are now getting importance where hatchbacks and SUVs are taking the big bite of the pie these days. However, in the market there are several automakers who have given the saloons a luxurious and most stylish feature to give the service to businesses and business tycoons. With the added style and features, the price bar went high and these saloons become the most expensive vehicles across the globe. They are not only the stylish and expensive but they are also the rolling art pieces of the manufacturers and encapsulating the demands of only one percent users in the market. The saloons are the most admired vehicles by the businessmen, actors, and celebrities across the globe. They are admired not just because of their performance but their luxury, practicality, and efficiency. These models go with lifestyle of the user and remained as mind blogging machines and would like to go with the style you like. There are SUVs and 4x4s, hatchbacks and superminis but saloons have their own power and authority in the market because they are the oldest body type used in the automotive industry. The saloons are the most elite class of driving machines on the planet earth and they are full of luxury and comfort at the same time. Since the invention of the cars at end of the eighteenth century, these cars have played a very vital role in determining the overall demand of the market. Almost 90 percent of the population of the world is known for these luxurious vehicles that there is a thing exists in the world that takes people from one place to the other place with comfort and ease. The saloons are the benchmark and the true emblem of the automotive industry. Find out which cars are likeb by footballers here. It is clear that you can conveniently and comfortably travel from one place to the other place and the saloons are the widely used medium. In the previous four to five decades, the number of cars has been increased significantly and people in the countries like the UK, are buying more than one vehicles at the same time and companies and businesses are using the fleets of cars and the majority based on the saloons. Some car enthusiast is just like the addicts of saloons and they have more than a dozen of these luxuries. They love to buy cars engraved with gemstones, jewels, and gold and diamonds engraved interiors. Some of these cars are luxury on the different way as they are being used by the most vulnerable personalities and celebrities across the globe and they need foolproof security. These cars are ready to offer everything from armored saloons to luxurious saloons. All of them are expensive and have their own standing in the market. 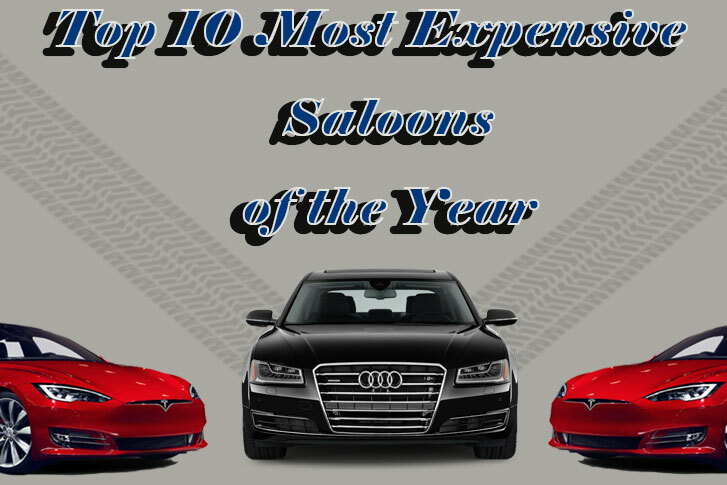 Let’s start with the least expensive saloon in this list of top ten most expensive saloons in 2017. The 2017 Lexus LS 460 is a Japanese vehicle which is designed and manufactured by the luxury division of Toyota Japan. The production models by the manufacturer are made available as a 4-door, 5-seat saloon body style only. This luxurious LS 460 with all its features starting at £82,305, in the UK. In the 2017 Lexus LS 460 All Wheel Drive Long Wheelbase Saloon, a 4.6 litre 8-cylinder engine has been installed to give it power. For further control and oomph in the overall performance, this powerful machine is further mated to mate to an automatic Lexus gearbox. This powerful gearbox is very helpful in saving fuel and delivering excellent fuel economy. These models started from somewhere around 70k. This model was powered by the same engine and returns an estimated fuel economy of 16 to around 30 miles per gallon. Apart from these stats, Lexus offers automatic gearbox with overdrive feature and all wheels anti-lock braking system as standard. Other features include an integrated navigation system, airbag occupancy sensor, curtain 1st and 2nd row overhead airbags and the side seat mounted airbags, driver and passenger knee airbag. The xJL is the UK made jaguar and it is a saloon offered in two styles, a 4-door and a 5-door version. In the local market, prices are starting at £74,400 for the base model. The 2017 Jaguar XJ XJ R-Sport is offered with an old school doctrine to give more control and more power, it is offered with Rear Wheel Drive system and powered by a 3.0 litre, six cylinder Jaguar engine. The power unit is further coupled to an automatic gearbox that returns an estimated fuel economy of 18 miles per gallon in the city traffic and 27 miles per gallon on the motorway. The top of the line 2017 Jaguar XJ XJL Portfolio All Wheel Drive, priced at £86,700 in the UK market, the model is powered by a 3.0 litre 6-cylinder engine coupled to an automatic gearbox that returns a claimed fuel economy of 17 miles per gallon in the city traffic and 25 miles per gallon on the motorway. The features comes as standard on the Jaguar XJ XJL Portfolio include 3.0 litre engine with V6 configuration, generating 340hp, further powered by an intercooled supercharger, 8-speed automatic gearbox which has an overdrive function, anti-lock brakes (ABS) on all four wheels, integrated satellite navigation system, overhead curtain airbags for the 1st and 2nd row passengers, side seat mounted airbags airbag, occupancy sensor for elevated protection, automatic climate control system, 19-inch aluminum alloys, cruise control system for better control at rough terrains, Anti-lock Brakes (ABS) and traction control system to fight with the UK road conditions in the winter season. Welcome to the German luxury models and the BMW M Performance comes first here, 2017 BMW M6 Gran Coupe is offered in two variations where a 4-door, and a 5-seat saloon covers the market. Prices starting at £117,500 in the market and the 2017 BMW M6 Gran Coupe Base version is powered by a 4.4 litre eight-cylinder engine transferring the power to an automatic unit that returns an estimated fuel economy of 14 miles per gallon in the city traffic and 20 miles per gallon on the motorway. The standard features list on the BMW M6 Gran Coupe Base is offered with 4.4 litre engine which is a V8 unit and capable of generating 560hp and further powered by a twin turbocharger for forced induction of air, 7-speed auto-shift manual gearbox with an overdrive function, anti-lock brakes (ABS) on all four wheels, integrated satellite navigation system, overhead curtain airbags for the 1st and 2nd row passengers, side seat mounted airbags airbag, occupancy sensor for elevated protection, automatic climate control system, 20-inch aluminum forged alloys, cruise control system for better control at rough terrains, Anti-lock Brakes (ABS) and traction control system to fight with the UK road conditions in the winter season. Tesla is proved to be a silent killer for the conventional car market and is offering world-class models where the 2017 Tesla Model S is available as a 5-seat saloon with four doors. The base prices in the UK market starting at £68,000, the 2017 Tesla Model S 60 Rear Wheel Drive version is powered by electric system which is a non-conventional power system mated to an automatic gearbox that returns an estimated fuel economy of 98 miles per charge in the city traffic and 101 miles per gallon on the motorway. The class leading model on the Tesla lineup is 2017 Tesla Model S P100D All Wheel Drive, priced at £135,000 in the UK, is powered by an electric system and there is no engine at all, the motor power transferred over the automatic gearbox that returns an estimated fuel economy or mileage range of 92 miles per charge in the city traffic and 105 miles per charge on the motorway. Audi has introduced several excellent saloons in the market and the 2017 Audi A8 is offered as a 4-door, 5-seat saloon. in the UK market, prices are starting at £82,500, while the 2017 Audi A8 3.0T is powered by a 3.0 litre six-cylinder engine coupled to an automatic gearbox that returns an estimated fuel economy of 19 miles per gallon in the city traffic and 29 miles per gallon while cruising on the motorway. The flagship 2017 Audi A8 4.0T Sport, priced at £91,500 in the UK market, and is powered by a 4.0 litre, eight cylinder engine shifting power at an automatic gearbox. The Audi A8 L 4.0T Sport comes with many features as standard and all those features include 4.0 litre v8 twin turbo engine capable of generating 450hp, an 8-speed gearbox with an integrated overdrive function, anti-lock brakes (ABS) on all four wheels, integrated satellite navigation system, overhead curtain airbags for the 1st and 2nd row passengers, side seat mounted airbags airbag, occupancy sensor for elevated protection, automatic climate control system, 20-inch aluminum alloys, cruise control system for better control at rough terrains, Anti-lock Brakes (ABS) and traction control system to fight with the UK road conditions in the winter season. When it comes to luxury, Maserati has no competitor in the U.S market and the 2017 Maserati Quattro porte is a 4-door, 5-seat saloon offered with a starting price of £103,400, the 2017 Maserati Quattro porte S Rear Wheel Drive is powered by a 3.0 litre six cylinder engine transferring power over the automatic gearbox that returns an estimated fuel economy of 16 miles per gallon in the city traffic and 23 miles per gallon on the motorway. The top of the line 2017 Maserati Quattro porte Gran Sport All Wheel Drive starts at £116,000 in the US markets and it is powered by a 3.0 litre, six cylinder engine mated to an automatic gearbox that returns an estimated fuel economy of 16 miles per gallon in the city traffic and 23 miles per gallon on the motorway. The flagship trim is the 2017 Maserati Quattro porte Gran Sport All Wheel Drive, priced at £116,000, is powered by a 3.0 litre, six cylinder engine connected to an automatic gearbox that returns an Estimated fuel economy 18 miles per gallon in the city traffic and 25 miles per gallon on the motorway. Luxury starts at Mercedes-Benz and it also ends at Mercedes-Benz s-class is the leader with dozens of trims and variations and all of them are saloons. The standard features of the Mercedes-Benz S550 Base include 4.7 litre engine with V8 configuration which is capable of generating 449hp and gets oomph from its twin turbo engine. A 9-speed automatic gearbox which has an overdrive function, anti-lock brakes (ABS) on all four wheels, integrated satellite navigation system, overhead curtain airbags for the 1st and 2nd row passengers, side seat mounted airbags airbag, occupancy sensor for elevated protection, automatic climate control system, 19-inch aluminum alloys, cruise control system for better control at rough terrains, Anti-lock Brakes (ABS) and traction control system to fight with the UK road conditions in the winter season. All these features are the part of the base model only, as long as features bar lifts up, prices also elevate to around £50,000 or even higher. Another local manufacturer in the row but relatively at higher grades of luxury. The 2017 Aston Martin Rapide S is a luxury saloon and is available as a 4-door, 4-seat body style. The Aston Martin cars repeatedly used in the Hollywood movies as well. The model prices starting at £206,000, the 2017 Aston Martin Rapide S model is powered by a 6.0 litre twelve cylinder engine which is further coupled to an automatic gearbox that returns an Estimated fuel economy 14 miles per gallon in the city traffic and 21 miles per gallon on the motorway. The 2017 Mercedes-Benz S-Class is another Mercedes-Benz in the row and it has even higher ranks in the list and thus the luxury, it is offered as a 4-door, 5-seat saloon version. Prices are starting at £131,400 in the UK, the 2017 Mercedes-Benz S-Class S 550 Rear Wheel Drive Cabriolet comes with several power options and the base model is powered by a 4.7 litre, eight cylinder engine mated to an automatic gearbox that returns an Estimated fuel economy of 17 miles per gallon in the city traffic and 25 miles per gallon on the motorway. The flagship 2017 Mercedes-Benz S-Class S 550 All-Wheel Drive 4MATIC Coupe is available at a price of £122,750, and it is powered by a 4.7 litre, eight cylinder engine mated to an automatic gearbox that returns an estimated fuel economy of around 17 miles per gallon in the city traffic and 25 miles per gallon on the motorway. The standard features offered on the Mercedes-Benz AMG S65 Base include AMG 6.0 litre V12 engine capable of generating 621hp from its twin turbo engine configuration, seven speed automatic gearbox which has an overdrive function, anti-lock brakes (ABS) on all four wheels, integrated satellite navigation system, overhead curtain airbags for the 1st and 2nd row passengers, side seat mounted airbags airbag, occupancy sensor for elevated protection, automatic climate control system, 19-inch aluminum alloys, cruise control system for better control at rough terrains, Anti-lock Brakes (ABS) and traction control system to fight with the UK road conditions in the winter season. Mercedes-Benz s class also comes with DISTRONIC PLUS distance pacing system. Bentley comes on the top of the manufacturers who are manufacturing the class leading luxury cars for the UK market. The 2017 Bentley Flying Spur W12 S, priced at £244,600 in the UK market. The luxurious most model is powered by a 6.0 litre, 12 cylinder engine mated to an automatic gearbox. The 2017 model with w12 engine configuration is capable of returning the fuel economy of 14 miles per gallon in the city traffic and 21 miles per gallon on the motorway. The 2017 Aston Martin Rapide S Shadow Edition is a flagship model and it is priced at £204,950, powered by a 6.0 litre 12-cylinder engine as well, it is mated to an automatic gearbox. The 2017 Bentley Flying Spur is also offered in a four door and five seats configurations and starting at £189,000, the 2017 Bentley Flying Spur has a V8 engine instead of a w12 engine, this engine is a 4.0 litre, 8-cylinder unit mated to an automatic gearbox that returns an Estimated fuel economy of 14 miles per gallon in the city traffic and 24 miles per gallon on the motorway. Are you a car owner? Here are some interesting tips for you on how to keep your car maintained.